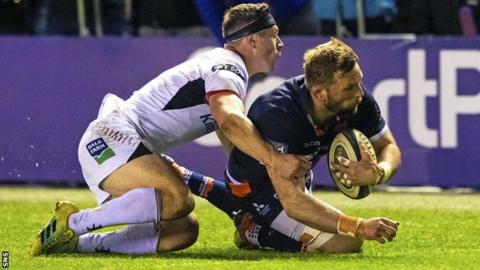 Head coach Richard Cockerill does not expect Edinburgh to make the Pro14 play-offs after losing to Ulster. Friday's 29-7 defeat leaves Cockerill's men a point behind third-placed Benetton in Conference B with one match remaining and the top three qualifying. Benetton tackle struggling Italian rivals Zebre next weekend - Edinburgh must hope for an unlikely slip-up and beat Glasgow Warriors at Scotstoun. "I don't expect us to make the top three," Cockerill told BBC Scotland. "We'll fight to the end. We've had some very big performances and big wins, but we've lost some games we should win. "We're not expected to win the championship but we've got to keep developing and I'm not going to accept this level of performance. We've got to go Glasgow and win - it's as simple as that." Cockerill's men made the play-offs for the first time in his debut season last term and this year finished top of a Champions Cup pool that featured French giants Montpellier, Toulon and Newcastle Falcons, but inconsistency in the league appears to have sunk their campaign. Zebre have won only three league games from 19 this season - their most recent came in October, against Edinburgh in Parma. Defeats such as this have cost the Scottish side dearly. Dragons have won four league matches this season - one was at home against Edinburgh; Southern Kings have only won twice - a stunning late win over Edinburgh in Port Elizabeth accounts for half that measly tally; and Edinburgh shipped a 17-0 half-time lead to lose at Murrayfield to Cardiff Blues two months ago. "Let's have a bit of context here," Cockerill said. "Week in, week out, we've got to be better than Leinster, Ulster and Scarlets consistently [to make the top three]. We're not funded the same as those guys. "We are still a developing team, we should do better, we shouldn't be losing against Kings, losing when 17-0 up against Cardiff, but there are some other things around that you have to recognise as well." Edinburgh were never in the game. You'd actually say Ulster deserved to win by more. Edinburgh losing at Murrayfield so convincingly is a big result - they've not looked that bad at home for a long time. Edinburgh lost to the Dragons, Zebre, Southern Kings - these are the games that, if you're serious, you just put to bed. They're non-negotiable. You at least get a win, and expect a bonus-point win. Cockerill's gone about it the right way - get that steel about them, work on their defence, and now the evolution of this team is, let's see their attacking game develop so they put away teams they should put away, and when they come up against a team like Ulster, they can throw different challenges at that defence to break it down.